Combining the world renown features of the Everlast Nevatear fitness bags with a precisely engineered, reinforced, High Density LDPE base structure that provides maximum flexibility with outstanding durability and resilience. This item cannot be shipped outside the United States or to AE,AA,AP,HI,AK. You are responsible for checking your state and local laws and regulations concerning the purchase of this item. Email your friend about the Everlast Free Standing Punching Bag. 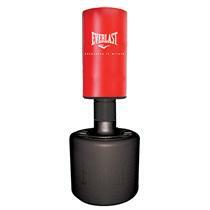 Ask a question about the Everlast Free Standing Punching Bag.